"He got naked and got inside Bristol Palin. 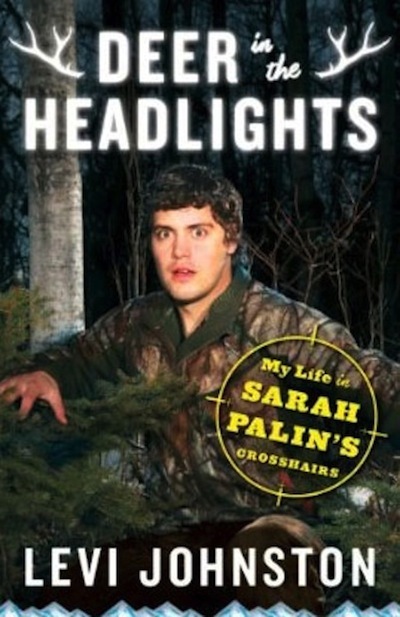 Then he got naked in Playgirl"
Levi Johnston's forthcoming memoir "Deer in the Headlights: My Life in Sarah Palin's Crosshairs" is available for pre-order on Amazon. And the cover is something special: Johnston, dressed in hunting garb, is posing like a literal deer in headlights, lest readers take the metaphor too lightly. He got naked and got inside Bristol Palin. Then he got naked in Playgirl. Now it's time for Levi to get you the naked TRUTH about Sarah Palin. Respect. It is worth recalling, in light of this, that Johnston told the AP that he was releasing the book for himself, for his "boy Tripp and the country." Thank you, Levi. And a note on context: Johnston smeared the Palins in a September 2009 Vanity Fair story, then apologized in People Magazine in mid-2010, but evidently felt there was a book's worth more to sell, sorry, say.